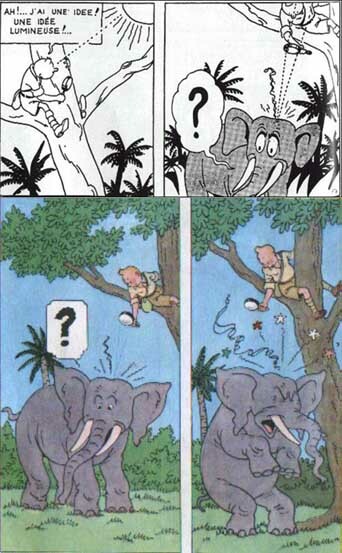 In Tintin in Congo, our reporter finds itself in front of an elephant : during a not very ecological safari, it shoots at the poor animal which doesn't suffer any damage. Irritated by the blow, the pachyderm continues our friend who takes refuge on a tree. How to make leave the elephant ? Tintin has one of his brilliant ideas and it burns the elephant with a magnifying glass. A magnifying glass is made up of a convex lens. That gives him the ability to make converge the luminous rays (it is for that that the magnifying glass enlarges the images). However there is a point, called hearth-image, where all the rays deviated by the lens meet. Moreover, the rays which the Sun sends to us have a certain quantity of energy. If in more one makes them converge, the hearth-image concentrates an important energy thus. It is thus possible to burn a bit of paper, to ignite the pipe of the captain Haddock (prisoners of the Sun), (but with difficulty) to even burn trousers (the secret of the unicorn). One can even, when the Sun is with the zenith, burn the skin slightly. But credibility stops here. Indeed, the skin of an elephant is much thicker than our. By admitting that the pachyderm remains quiet, it is possible to burn it with a magnifying glass but it is necessary for that much more time than Hergé wants to make us believe. Another data should moreover be added : it is incredible that during all this time, the elephant which feels the burn remains wisely with the foot of the tree. 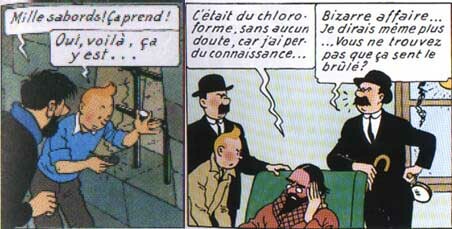 But despite everything, the Hergé's idea remains good and astute!